I can’t imagine what kind of hell you’ve been going through the last week with all the public backlash. This decision you’ve made, I can only suspect, must be one of the hardest things you’ve ever had to do. Whatever your reasons, I wanted to say from the bottom of my heart, that your work at Netscape and Mozilla over the past two decades have been direct influences and motivators of my love for programming, and my career. You’ve literally been a hero of mine since I was a teenager. Since then, my life’s work has been centered around creating great open source software. When I finally got a chance to meet you and work for you (however far removed) in 2012, it was like a dream come true. I know that we’ve only had a handful of direct conversations, but despite that, I want to thank you personally for all that you’ve done in the name of breaking down barriers. You’ve had a tremendous impact on my life. For the last year or so, Space has slowly been creeping it’s way into every facet of my life. It started when I picked up a pair of Celestron binoculars on a whim. They showed me things I had never seen before: stars in beautiful hues of blue, red, and white; stars that change color when they twinkle, the moons of Jupiter, the Orion Nebula, and amazingly detailed craters on the moon. When I turned 30 later that year, Paige turned my new fascination into an outright obsession by buying me an Orion 8″ Dobsonian telescope. My eyes were suddenly opened to the entire universe, as I started first in our own solar system: I saw the planets Jupiter and Saturn in glorious detail and color, the red disc of Mars, the beautiful crescent of Venus, and surprisingly even more beautiful detail on the lunar surface. Traveling outside of our solar system, I decided to go on a hunt for all 110 of the objects on the Messier object list, which contains several famous Astronomical objects, such as the Orion Nebula, the Andromeda Galaxy, and much much more. In fact, I am still on that hunt today, and have logged well over half of that list. With my enthusiasm for amateur astronomy growing by the day, and my curiosity of space at an all time high, I decided to start listening to the entire back archives of the AstronomyCast podcast. The more I learned, the more I wanted to learn. I found myself taking part of an online introduction to Astronomy course, learning the math, and even passing a few of the tests! As my Facebook profile started to fill with links to space articles, my Mom forwarded me a Youtube video of a man sending his son’s toy train to “near-space” in a weather balloon. The video was so inspiring, and so touching, that I knew I had to do the same. After a few months of toying with the idea, and reading as much as I could find about the subject, I decided I would take the plunge. This project is still a work-in-progress for me, and I intend to blog more about it in gory technical detail very soon. For those interested in working with NanoSatisfi as an employee, advisor, or investor—contact Peter Platzer at peter@nanosatisfi.com. Platzer says, “Talk to us now, not in three months…things are moving fast! This was too good to be true. A space startup building a software platform, and they were looking for people! After reading this article, I quickly fired off an email to Peter, telling him why he needed to hire me. Peter responded promptly, and after a few exchanges, I started building a prototype web-based control center that showed a satellite orbiting a 3d earth in real time. This apparently impressed Peter enough that he wanted to start talking about employment! Today marks the last day of a long journey for me at Appcelerator. To say that this experience changed my life would not do it justice. In these last 4 years, I’ve learned more about technology startups, engineering, management, and the kindness of people than I could have ever imagined. I’ve also made many new friends and colleagues that I can only hope I will get the privilege of working with again. My reasons for leaving are my own (I don’t want to air dirty laundry in public), but I truly wish everyone at Appcelerator luck with their mission. I’d also like to announce that I will be joining Mozilla to work on the Boot2Gecko project full time. I don’t have details about which part of the OS I will be working on yet, but I get the impression that most of the engineers on the team work on whatever is needed. This project is extremely exciting for me, as Mozilla is trying to bring the looming reality of the Web as the native platform for mobile devices. Many people in the mobile industry see this as an inevitability, and I can’t wait to join the team that is proactively trying to make it happen. To give a little background: racing and owning a Corvette has been a childhood dream of mine ever since a high school friend of mine drove me around in his beautifully maintained silver ’82 C3. Predictably, that beauty of a machine was totalled when he drove me home one day, and failed to stop correctly at a 4-way stop. I was crushed, because I honestly loved that car. Ever since that day, my love for Corvettes has mostly been the stuff of fairy tales — the magical unicorn that will never be within reach. On Saturday though, Paige made that dream a reality. Before actually taking part in the ride, they gave us a 30 minute crash course on safe riding, which included where to keep your hands on the wheel, where to look when driving, and how to let other drivers safely pass on the track. A lot of this info I remember verbatim from driver’s ed as a teenager, and it honestly all goes out the window the second you’re in the driver’s seat. After the instruction, all the drivers collected in van that lapped the track twice, showing us the various apexes and correct racing lines. A secondary truck also passed us and we passed them to show the correct passing procedure. Once out of the van, it was time to suit up, and drive these bad boys. The Corvettes they gave us were bright-yellow, sticker adorned stock Z06 models with 450HP, and outfitted with carbon fiber Brembo pads that facilitated faster braking. They thankfully also kept the tried-and-true stick shift, though it was only used at the beginning and end of the ride, since they implored us to stay in 4th gear throughout the ride. Once inside, the staff tie you down with a 5-point harness extra tight and adjust the seat so you’re not over stretched or hugging the dash. In the passenger seat is a racing instructor who gives you signals and advice on how to get the most out of the ride (the most common advice being: “GAS, GAS, give it more!”). The track itself was 1 mile long, with two ~150 degree turns, and some smaller tight S curves.. not exactly the Nurburgring, but I’m not exactly The Stig either. The drive itself was everything I hoped it could be, and much more. The first few laps were really intense, and tested my resolve to it’s limit. Turning tight into curves going 60-70 MPH is really breath taking, and you’re just not ready for it until you can get a feel for the car’s dynamics. 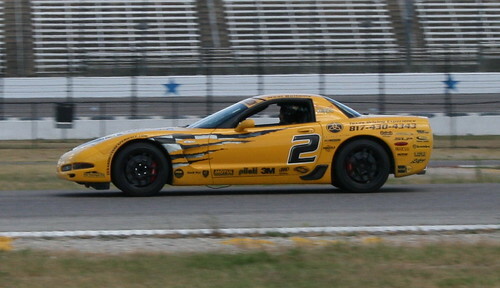 After the first few laps, I felt more comfortable, and I let the gas pedal have it. The sheer acceleration on this car was adrenaline inducing, and the engine let out the gutural sound of a magnificent beast. Hugging the outer line of two quick curves while maintaining speed was also a transformative experience; equally frightening and amazing. I don’t think I ever topped my max speed of around 90+ MPH, but it was hard to pay attention to the speedometer when every moment required my total attention. On my 10th lap, the checkered flag waved, and it was time to let the brakes take a break (hah! ), and do a final “idle” lap without using them. After my drive, it was time to do switch, and let the instructor show me how it’s done. My instructor and the car in front of has both raced in the Indy 500, and their dance was simply amazing to behold. There was never more than a few feet between the two cars, and they danced back and forth, passing each other in 2 spots on the track with precision. Needless to say, after the instructor ride along, I was slightly shaky and left with a new appreciation for professional drivers. During the whole experience, Paige and Kayla had to put up with 100+ degree weather in the Texas Sun, and I’m very grateful that they did, as Paige posted several photos, and soon a video of a few of my laps. Thanks again babe, for making this the best Father’s Day yet! A project that started nearly a year ago as an experiment to learn and test the internals of Titanium Mobile, after several rewrites and redesigns, has finally hit the App Store. So what does the app do? In a nutshell, DARTpal is an app for riders of the DART rail in the DFW area. It provides a trip planning interface, a station locator, upcoming departures, a live twitter stream of @dartmedia, fare information, and links to the DART and TRE customer service lines / websites. You can see screenshots and more info on the iTunes app page, or follow @DARTpalApp on twitter. Along with DARTpal, I’m re-purposing a domain I bought several years ago to launch a new personal brand that I can use for any/all apps that I release called HotTea Software. This will serve as a place for all my personal projects, and will also have a forum for users of DARTpal.